The dirty martini has a wonderful saltiness that is fascinating against the gin and vermouth background. "Dirty" simply refers to the addition of olive juice or brine. It is a classic cocktail that is very easy to mix up and one of the most popular variations on the original gin martini. You can make this drink as dirty as you like by pouring the olive juice to suit your taste. It may take a few rounds to find a perfect balance for you, but the experiments are fun. As you explore different brands of gin, you will want to make adjustments as well. The key to making a great dirty martini is to use high-end gin and vermouth and to add olive juice to lightly flavor it. There is a big difference between making it filthy rather than dirty, so take it easy at first. Pour the ingredients into a mixing glass filled with ice. Garnish with one or three olives. It may be an old bar tale, but it's said that an even number of olives is bad luck. As with any of the basic martinis, feel free to adjust the gin-vermouth ratio to your liking. The drink can also be made with your favorite vodka. Using the liquid in an olive jar as your source is a great idea, especially if you invest in good olives. There are many gourmet olives available, stuffed with everything from the standard pimento to blue cheese or jalapeño. The brine from each of these is going to have a slightly different taste and you may prefer one over the other. Keep in mind that olives should be refrigerated. This is a common mistake in bars and you'll find some bartenders making a dirty martini using warm juice from the garnish tray. It's a bad habit and rather disgusting and unsanitary. Luckily, many have changed their ways and are either refrigerating separate brine for martinis or using bottled olive juice. Some bartenders also suggest using a few dashes of olive oil instead of brine. It's a good option if you are not a fan of the dirtier aspect of this cocktail. It adds just a hint of olive flavor beyond what the garnish can deliver. Just be sure it is only 1 or 2 dashes or you will create an oil slick in your glass. In the cocktail world, olive juice and brine tend to mean the same thing, but there is a difference. Olives have their own juice and it is pressed out of the fruit to make products like olive oil. It is also used to flavor the brine that the olives are cured in. It is common to refer to the liquid in a jar of olives as olive juice even though it technically a brine, which is defined as any salted water. Many people prefer to use the brine (or juice) that is in a jar of olives for their dirty martini. And, why not? If you have olives, you have the juice right there. It is very convenient and a cheap addition to the drink. In recent years, there has been an explosion of olive juices designed specifically for the dirty martini. Many of these are specially crafted using distinctive recipes and they can vary quite a bit from one to another. It may take some time to discover which bottled olive juice you like best, so keep trying. Dirty Sue is a favorite for many dirty martini devotees. You might also try the cocktail-worthy olive juices from Boscoli, Fee Brothers, Filthy Olive, Fragata, or Stirrings. If your local market has an olive bar filled with gourmet olives, use them to make your own olive brine. It is very easy and allows you to customize the selection of olives, even adding a variety to a single jar. The best part is that you can control the juice. Not only can you make it exactly the way you want, but you also know what's inside. This simple DIY project can save the die-hard dirty martini drinker a considerable amount of money. As an extra bonus, you also get a custom choice of olives for garnishing all of your martinis. To make a basic brine, you will need 2 cups green olives, 2 cups water, 1/2 cup dry vermouth, 2 tablespoons vinegar, and 2 tablespoons salt. Any of these can be adjusted to taste as you perfect your own recipe. Place the olives in a glass jar with a tight-sealing lid. Recycled olive jars are a natural choice, but mason jars work great as well. Gently press the olives with the back of a wooden spoon firmly enough to release their juice. Try not to smash them as if you're muddling fruit for a cocktail. In a separate bowl, combine the other ingredients and mix well. Pour the liquid over the olives until they are completely covered. Leave a little room for air at the top of the jar. Seal the jar and shake it vigorously. Refrigerate for at least one day (longer is better) and shake before using the juice. If your juice gets a little low for the olives left in the jar, add more vermouth and give the mix a good shake. If you are lucky enough to have your own olive tree, nothing beats fresh olives. In order to make them edible, you will want a few tips for curing and brining fresh olives. How Strong Is the Dirty Martini? Martinis are not weak drinks and that is why they are served between 3 and 4 ounces. 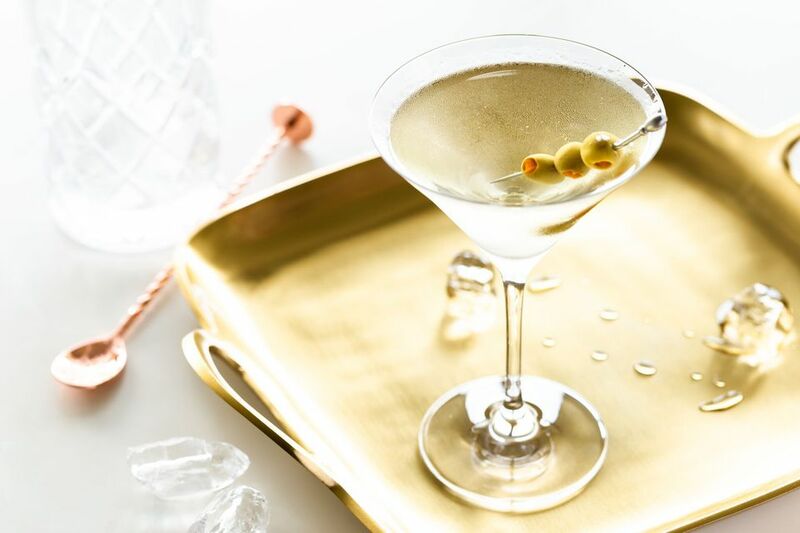 With an 80-proof gin and a 30-proof vermouth, this dirty martini recipe is a heavyweight. Its alcohol content will be around 29 percent ABV (58 proof). Gibson and Martini: Do You Know the Difference? Espresso Vodka In Your Dry Martini? Yes, Please!